You don't need a garden to grow this charming crop of cactuses - just a crochet hook, some yarn and a little crochet know-how! 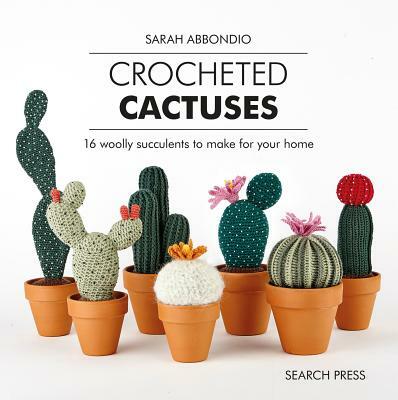 This delightful little book contains 16 patterns for crocheted cactuses that can be used to decorate your window ledges, your table and anywhere else in the home. They don't need watering or feeding, don't have sharp spines and are quick and easy to make! Using simple crochet stitches and widely available yarn, there are diverse varieties to choose from, which are inspired by real cactus species. Some are embellished with beads and others have ridges, flowers, bobbles and look just like the real thing. They make perfect, quirky gifts for friends and family and all they need is a plant pot to sit in. With a short techniques section at the beginning of the book to get you started, you can make a whole display in no time - so pick up your hook and yarn and get started! Sarah Abbondio is a Danish/Swiss designer who has been interested in creating things since she was very little. She trained as a design engineer and has been working as a independent designer and product developer for several Danish brands. Her interest in crochet started when her daughter was born and she wanted to create a unique toy for her. Sarah taught herself to crochet and it has been her primary hobby ever since.